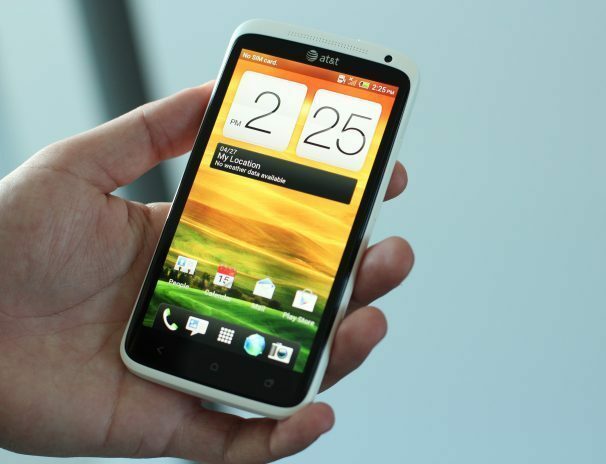 The HTC One X has a brilliant 4.7-inch display. It was love at first sight: From the moment I unboxed the HTC One X ($200 with a new two-year contract on AT&T; price as of as of 5/1/2012) I immediately fell for its slim profile and brilliant 4.7-inch display. But it was more than just the phone's good looks that snagged my heart, as the HTC One X came with a tasty serving of Ice Cream Sandwich (Android 4) and a long enough battery life to keep me satisfied for hours on end. But like all romances, this one was not without its sour spots, and even the One X's smoking-fast LTE connectivity was not enough for me to overlook the phone's poor call quality and its clunky HTC Sense overlay running over Android. The One X has a lightweight carbonate body and an 8-megapixel camera. The HTC One X is a great-looking phone. The white polycarbonate body makes the phone lightweight without compromising durability, and the 4.7-inch 1280-by-720-resolution Gorilla Glass display should be roomy enough to accommodate even the pudgiest of fingers. Though the phone packs a large screen, it never felt too big to hold, and I had no trouble slipping it in or out of the pocket of my jeans. Besides the aforementioned screen, the front of the phone also holds a set of three hardware navigation buttons (Back, Home, and Recent Apps), as well as a 1.3-megapixel front-facing camera. On the back is an 8-megapixel camera (more on it later), and a set of pin connectors for hooking up the One X to compatible accessories, like a car or media dock. The power button sits comfortably at the top of the phone, right next to the microSIM card slot. During my time with the phone, I found that excessive shaking could cause the SIM card to jostle in its slot, making the phone think that the SIM card had been removed. This shouldn't be a problem for most people, but if you use your phone while running, you could encounter some issues. Whereas the international version of the One X ships with an Nvidia Tegra 3 quad-core processor, the AT&T version is powered by a Qualcomm 1.5GHz dual-core Snapdragon S4 processor. The reason for this is that the dual-core S4 supports LTE connectivity while the Tegra 3 did not at the time of manufacturing. Despite the fewer cores, the One X is an utter beast when it comes to performance: Apps all ran buttery-smooth, and the phone never once stuttered or stalled when running even the most graphics-intensive games. The One X can connect to AT&T's relatively new LTE network, which performed impressively fast in San Francisco. Apps would download in seconds, and most Webpages loaded almost instantly. Using the Ookla Speed Test app here in PCWorld's San Francisco office, the HTC One X managed to get download speeds of up to 24 megabits per second (mbps), with uploads going out around 9 mbps. This was in an area with a strong data connection, so you'll likely see those numbers change based on how coverage is in your region. Keep in mind that AT&T's LTE network isn't everywhere yet, so not everyone will be able to take advantage of these speeds right away. 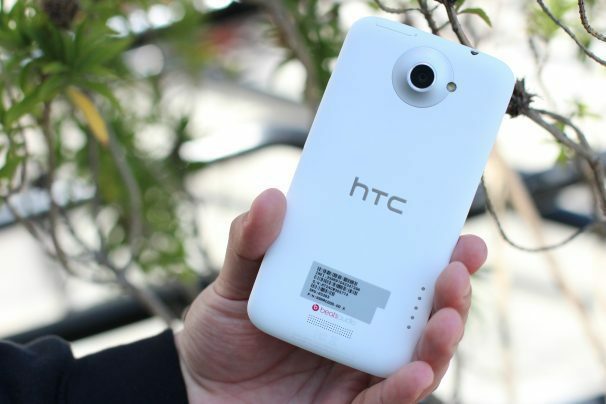 Like the HTC One S, the One X suffered from subpar call quality. While voices on my end came through loud and clear, the people I called said that my voice sounded murky and slightly muffled. They also mentioned that some of my words were randomly dropping out and several times had to ask me what I had just said because one or more words failed to go through. I checked to make sure I had full bars, restarted the phone, and even made sure the SIM card was seated properly, yet the problem persisted. Definitely not something you want to have to deal with in a top-of-the-line handset. A problem that many smartphones have is poor battery life. Thankfully this was not the case with the One X. After 5 hours of texting, downloading apps, playing games, making phone calls, and browsing the Web over LTE, I managed to knock the battery down to 70 percent. This was with GPS, LTE, and Wi-Fi turned on, and with the screen brightness set to max. While we have yet to conduct our official PCWorld Labs battery tests on the One X, I think most people will be able to make it through an entire day without needing to charge the phone. HTC's Sense overlay provides some stylish and useful widgets. The One X comes loaded with Android 4.0.3 (a version of Ice Cream Sandwich) and, like most other HTC Android phones, it runs the Sense overlay on top of the standard Android interface. Sense has a variety of stylish and useful widgets, and lets you quickly launch applications directly from the lock screen. The HTC music app has been updated and now acts as a central hub where you can quickly see and start all of the music apps on the phone. The Sense camera app is also noteworthy, as it adds a variety of new shooting modes. I found it vastly superior to the camera app in stock Ice Cream Sandwich. Sadly, those features were the few bright spots in Sense. The overlay feels dated compared to the plain Ice Cream Sandwich interface, and certain things (like changing the phone's wallpaper) now require you to dig through extra menus to find them. The phone comes with a handful of preinstalled software, including AT&T's suite of mobile apps and the MOG Music app. Some of these applications could be useful to people, but it's a shame that you are not given the option to be able to uninstall them. Ice Cream Sandwich does provide a way to disable these apps and prevent them from showing up in your app drawer, but they’re not completely deleted from your phone and thus still take up precious memory. When it comes to entertainment, the One X is more than capable of holding its own against other phones with strong multimedia capabilities. The HTC phone's beefy processor will allow you to play pretty much any game you find on Google's Play Store, and the high-definition display makes the One X ideal for watching movies. If music is more of your thing, you'll greatly enjoy the improved music hub and having all of your audio apps in one central location. Liike HTC’s other One phones, such as the One S, the One X comes with Beats Audio built in for an "improved" listening experience. In my hands-on testing, I didn't notice much difference between when Beats Audio was on or off. My colleague Ginny Mies, however, did notice improved audio in her review of the HTC One S for T-Mobile. Beats Audio will automatically turn itself on if you plug in any pair of headphones, but the software is supposed to work best if you use headphones that are Beats-compatible. However, I didn't have a pair of Beats headphones handy, which may account for my not being able to hear much of a difference in my test track. Unfortunately, if you have a large music library, you'll be out of luck: The One X has only 12GB of usable storage and no microSD card slot. If you have tons of music and want to carry it all with you, I would recommend using Google Music to stream your library to the phone over LTE. You'll have to make sure that you aren't going over your monthly data limit, but at least you'll be able to listen to your entire music library on the go. Outdoor test shot taken with the HTC One X's camera. As I mentioned earlier, HTC's camera app is much better than the standard Android one. With the One X you can apply a variety of Instagram-like filters to your photos, and the camera software features a "burst mode" that allows you to take pictures in rapid succession and keep the one you like the best. This is useful for photographing family pets or other subjects that just won't stay still. The 8-megapixel camera on the One X was decent, but had its share of faults. Images were sometimes blown out, with colors appearing oversaturated. Outdoor shots came out looking sharp, but photos taken indoors did have a shocking amount of graininess to them. The front-facing camera wasn't much better, though I don't think it'll be used much outside the occasional self-portrait or Google Hangout. Overall, the camera on the One X works well for everyday photos, but it won’t replace a stand-alone camera any time soon. Thanks to its dual-core processor, the One X is able to record HD video in 1080p. The video quality came out looking great, and I didn't notice any problems when filming indoors or out. One nice thing about the One X is that you can still take pictures while recording video by pressing the camera button. A nice extra that I hope other smartphone manufacturers take note of. Sadly, while the video itself was very good, the audio was awful: People sounded as if they were underwater, and audio in the video I shot of a busy street corner could have been of someone rolling around a tin can full of gravel. In short, you won't be filming your next blockbuster on this phone unless you are planning on entering a silent film festival. The HTC One X is a fantastic phone, providing you can overlook its flaws. For some, the below-average call quality will most likely be a deal-breaker. For others, the One X's weak audio recording capabilities and inclusion of bloatware will be what drives them to another handset like the Nokia Lumia 900 or Apple iPhone 4S (also both on AT&T). But for those who want a truly superior Android experience in a premium design and can look past these problems, the HTC One X will be a phone that you can proudly show off to your friends.